On Wednesday, March 25, in the Church the Annunciation, Pope Francis celebrated the Incarnation as Archangel Gabriel visited the humble Maiden of Nazareth and announced she would conceive and give birth to the Son of God. The pope incorporated this feast day into his Wednesday address as he continued his course of catechesis on the family because, with Joseph, Jesus was born into an actual human family. This Wednesday focused on an actual pause for prayer. During the Annunciation and Incarnation, we see the Divine at work in an ordinary home. According to Pope Francis, the “condescension of God,” means the Almighty reveals Himself to us and humbly takes on our flesh in the modest home of Mary. Similarly, man has permission to allow God to come into his ordinary life with blessings, illuminating his mundane daily ritual with love, the light of the truth, faith, beauty and hope. The second aspect of March 25, Solemnity of the Annunciation, is the Day for Life. Twenty years ago, Saint John Paul II signed the Encyclical Evangelium vitae. To recall this anniversary, many followers of the Pro-Life Movement were in the crowd on Wednesday. In Evangelium vitae, the family occupies a central place, in as much as it is the womb of human life…. the human couple is blessed by God from the beginning to form a community of love and of life, to which is entrusted the mission of procreation. Celebrating the Sacrament of Marriage, Christian spouses render themselves available to honor this blessing, with Christ’s grace, for their whole life. On her part, the Church commits herself solemnly to take care of the family that is born, as gift of God for its life itself, in good and bad times: the bond between the Church and the family is sacred and inviolable. The Church, as Mother, never abandons the family, even when it is humiliated, wounded and mortified in so many ways. Not even when it falls into sin, or distances itself from the Church; she will always do everything to try to take care of it and heal it, to invite it to conversion and to reconcile it with the Lord. In order to fulfill this mission, the Church must pray– “a prayer full of love for the family and for life, a prayer that is able to rejoice with those who rejoice and suffer with those who suffer”. Only prayer will sustain and animate the Church with God’s grace. Only with prayer will the Church remain committed, grow more united and stand “in the testimony of the truth of the love of God and of his mercy for the families of the world, none excluded, be it inside o outside the sheepfold”. 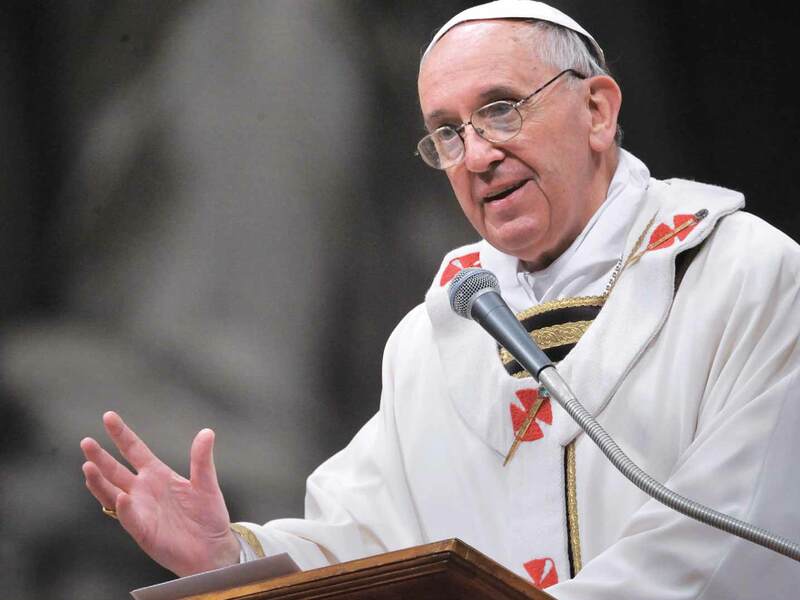 Francis admonishes the entire Church needs to pray, from the “Pope, Cardinals, Bishops, priests, men and women religious, lay faithful.” Pope Francis has often suggested specific prayers, calling us to pray for the Holy Spirit to fill the Church, together as a family, for those in prison, for his own ministry and to pray the Rosary. Quoting scripture, the pope stresses our prayer should “not be lacking.” This means we should constantly be praying as St. Paul says “without ceasing.” (1 Thessalonians 5:17.) The phrase Pope Francis uses is to commend a prayer with “holy insistence.” Then as an example, to start us praying for the Synod on the Family, Pope Francis leads the Wednesday crowd in a prayer, a prayer he hopes everyone will continue in their own homes.